Mark, Scott, and I headed out in the early afternoon to Allentown; finding that parking wasn’t yet open, we stopped at a TGI Friday’s for an early dinner. Taking a different way back to the Fair, we found a Boy Scout Troop selling parking spaces for $5, less than the $8 the fair was charging, with much better street access. It was appropriate, because when the show was done I wanted to get the hell out of that venue. 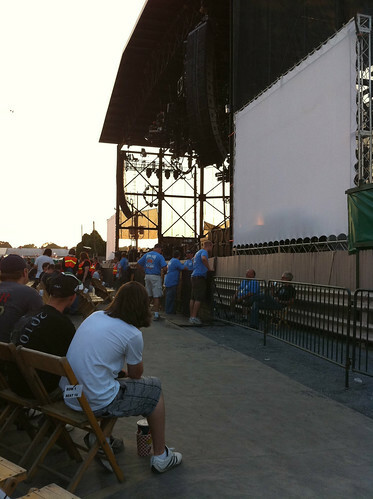 I hated the seats at Allentown Fair, but I always love seeing Rush. Their films before, during intermission, and after the show were better-produced than ever, and very funny. They came out with a strong “Spirit of Radio”, and highlights in the first set for me were the new single “BU2B”, the first live treatment of “Presto” (probably among my top 15 personal favorites), the triumphant return of “Marathon”, and “Workin’ Them Angels”. Set two was led off by the seven-song “Moving Pictures” set, and it was the first time I got to see “The Camera Eye” performed live. It was quite satisfying, although there were some awkward (to these ears) edits that took about 1.5 minutes out of the song. I enjoyed the new single “Caravan” as well, and Alex’s new 12-string intro to “Closer To The Heart” was transcendent. I actually played part of that on 12-string acoustic myself performing at Mark’s birthday party last Saturday. Nowhere near Lerxst’s talent, that’s for sure, but it was heartfelt. The encore of La Villa Strangiato (with a carnival-themed keyboard intro) and Working Man was a satisfying end to a great show. Songs from many albums were represented, and I didn’t miss the drop of “Dreamline” from the set. Looking forward to getting the new album “Clockwork Angels” next year and seeing Rush live yet again! Next time I’ll be more careful about what seats I purchase!